The multi-talented Waitkus had been deemed a “natural” during his rookie years before he joined the U.S. Army and received four Bronze Stars for his service in the Philippines. He returned from the war and became a rising star for the Chicago Cubs, and it was at Wrigley Field on April 27, 1947 that 17-year-old Ruth Ann Steinhagen (born Ruth Catherine Steinhagen before she changed her middle name) first laid eyes on him. 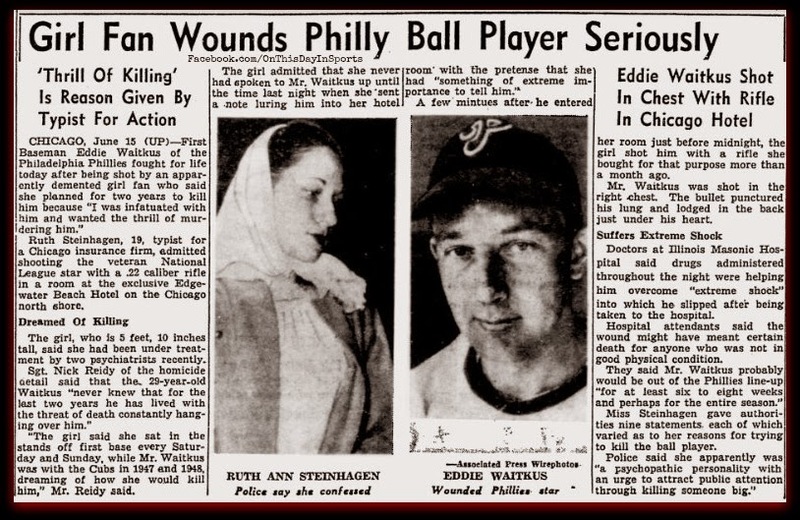 For more than two years, Steinhagen’s infatuation with Waitkus grew, including after his trade to the Phillies after the 1948 season. On June 14, 1949, the Phillies returned to Chicago for the first of a four-game series against the Cubs, winning 9-2. Now 19 and working as a typist, Steinhagen attended the game and followed Waitkus back to the Edgewater Beach Hotel that evening, where she sent him a note using the alias of “Ruth Anne Burns”, a woman he was acquainted with, insisting that he come to her room to discuss “something of importance.” When Steinhagen refused to explain any further over the phone, Waitkus went up the three floors to her 12th floor room. “I have a surprise for you,” Steinhagen greeted him, supposedly introducing herself as Mary Brown, a friend of Ruth Anne Burns. The consequences of lust, per Malamud; Roy Hobbs ended up with a belly full of lead while Harriet discovered she was a Bird that couldn’t fly. 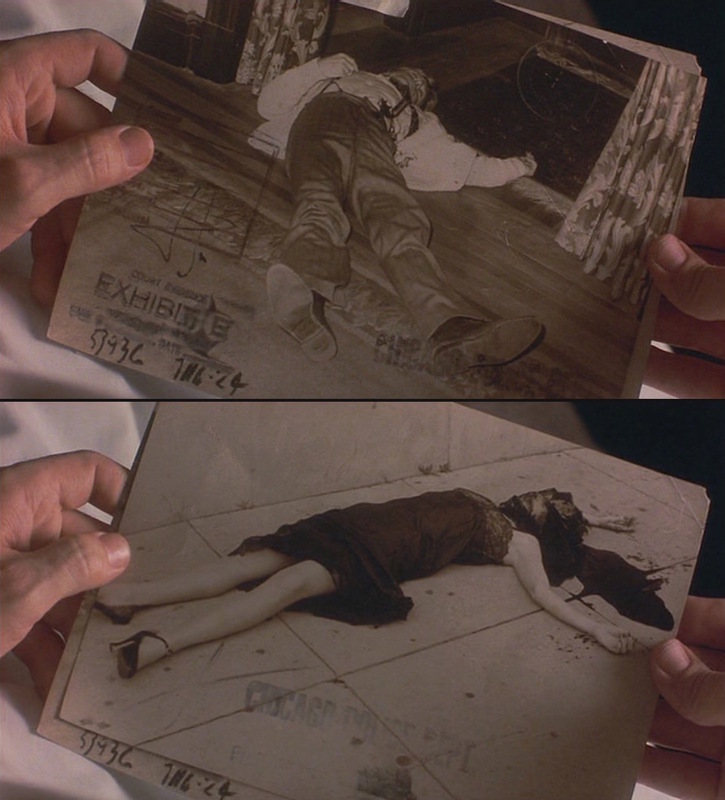 Steinhagen’s plan to stab Waitkus then shoot herself was muddled when the first baseman took a seat. Nevertheless, she pulled a .22-caliber rifle from her closet and shot Waitkus as he stood back up. The bullet just missing his heart and lodged in his lung. She knelt beside the wounded Waitkus, placing her hand on his as he asked: “Oh, baby, what did you do that for?” Unable to find a second bullet to shoot herself, she called the front desk of the hotel to announce “I just shot a man…” and waited for the medical attention that would save Waitkus’ life. Unlike Roy Hobbs, Waitkus did not need to wait 16 years to return to baseball and donned his uniform again just two months later on August 19 for “Eddie Waitkus Night” at Shibe Park. Despite his 1950 season that led the “Whiz Kids” in scoring and recognition as the Associated Press “Comeback Player of the Year”, the incident haunted Waitkus for the rest of his life as he developed a drinking problem and was always concerned that people questioned his motives for going to Steinhagen’s hotel room in the first place. While Waitkus may have had some valid reasons to visit Steinhagen’s room based on the note to him sent using an actual acquaintance’s name, the moment was transformed by Malamud into a morality lesson as it was more lurid impulses that guided Roy Hobbs to Harriet Bird’s room and the business end of her .38. After a brief prologue set during his formative years, we officially meet Roy Hobbs, the picture of all-American innocence: a seemingly incorruptible blond-haired, bright-eyed teenager (played by a 47-year-old Robert Redford!) in a tweed cap and cardigan, going off to play baseball for the big leagues! Roy, age 19, spends one final night with Iris (Glenn Close) before heading off to try out for the Cubs. 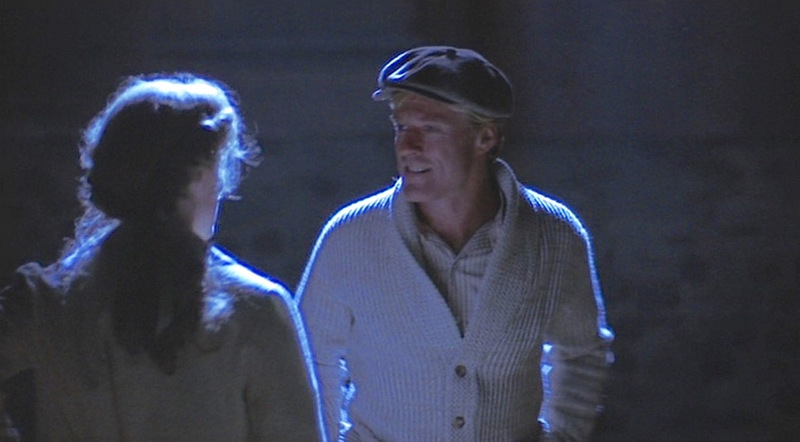 One of two “hero” sweaters worn by Robert Redford in The Natural, courtesy of The Golden Closet. 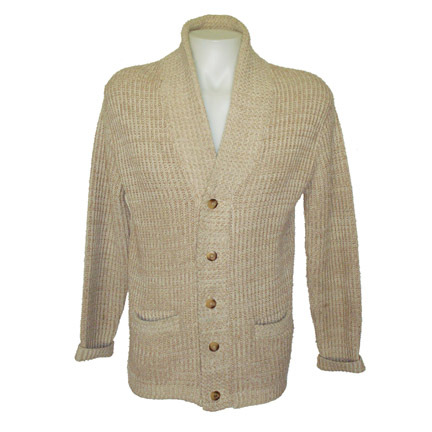 According to its listing at The Golden Closet, Roy’s long beige cardigan was one of two knitted for the production by Broadway Knitting Mills, which had modified a loom to match a period-correct knit pattern. The sweater has a rounder knit up the wide placket and around the neck, which folds over into a shawl collar when Roy wears it. It has five mixed brown plastic sew-through buttons and welted pockets on the hips. It may be significant that the next time we see the cardigan after the Nebraska-set opening, Roy is in Chicago after a train ride that led to his acquaintance with the dark, mysterious, and alluring Harriet Bird. 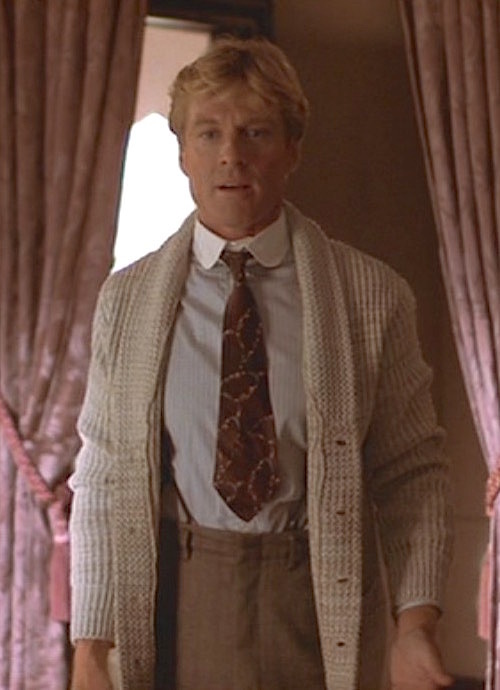 After she calls his room, Roy throws the cardigan over his shirt and tie and eagerly strolls off to his fate. Roy’s shirt is light blue with subdued brown stripes. It has a front placket and single-button rounded cuffs. Per the predominant style for dress shirts in the early 1920s, the shirt does not have an attached collar and is instead worn with a white rounded club collar that can be removed, cleaned, and starched on its own. As laundry capabilities increased and formality decreased over the course of the decade, the detachable collar became an old-fashioned relic reserved solely for formal wear, and even then it was soon eclipsed by attached-collar shirts by mid-century. 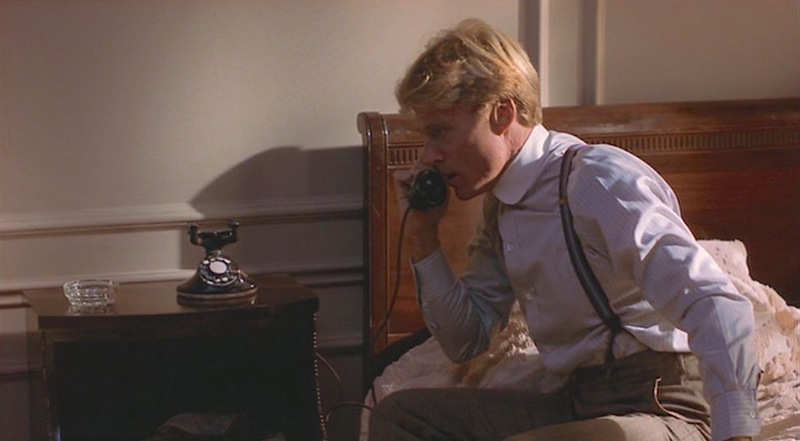 Roy Hobbs takes a phone call that he should have avoided. Roy wears a brown tie with a tan vine-like pattern in the Deco tradition, tied in a tight four-in-hand knot that barely fills the space between the leaves of his detachable club collar. 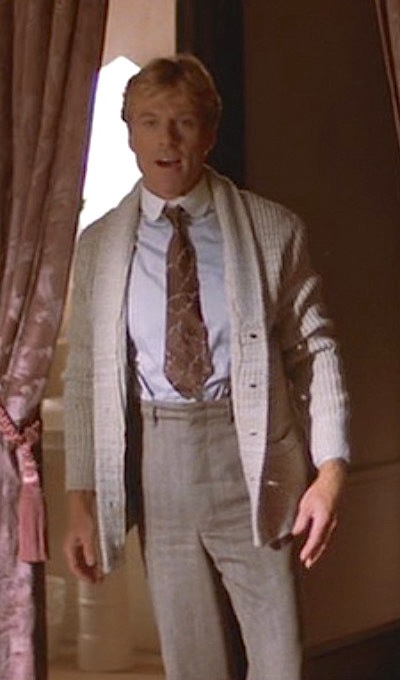 Roy’s light brown striped flat front trousers have belt loops, though he neglects these in favor of wearing suspenders (braces) instead, fastened to buttons on the inside of his trouser waistband. The trousers also have straight pockets along the side seams, jetted back pockets, and turn-ups (cuffs) on the bottoms. Connected to the inside of the trousers via tan leather hooks, the suspenders have thick burgundy stripes on the outer sides with thin light blue stripes more concentrated in the center for a gradient effect. The lack of formality and general palette of the outfit call for brown footwear, and Roy meets this calling with a pair of light brown calf lace-ups and darker brown socks. …and getting shot in the belly. Redford again proudly wears the silver ring on his third finger, which he received as a gift in 1966 from the Hopi tribe and has worn in almost all of his movies since. The ring is more an affectation of the actor than anything connected to Roy Hobbs. 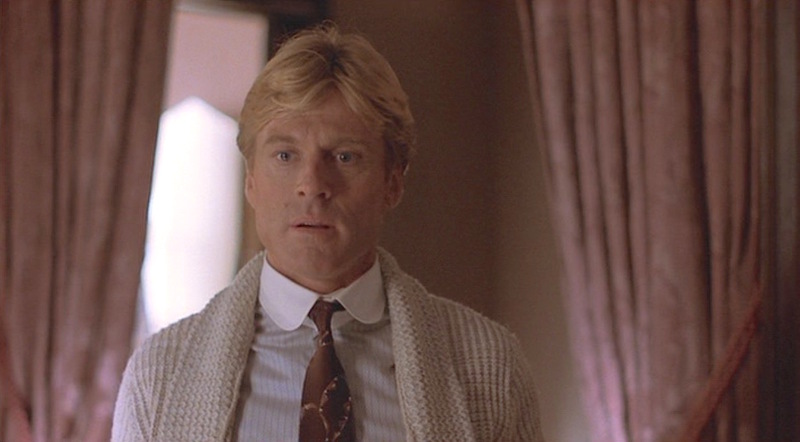 Though arguably dressed in the fashion of the early ’20s, Roy Hobbs looks every bit the innocent, All-American baseball hero when he stands in Harriet’s doorway with his shawl-collar cardigan, starched white collar, and suspenders. The latter two may be less fashionable for casual wear, but there’s no reason not to have a thick cardigan like Roy’s in your wardrobe. Check out the movie… and give Bernard Malamud’s 1952 novel a read but be advised that the film took many liberties—often for the better—from its source material. You can also read more about the actual Eddie Waitkus shooting in this compelling excerpt by Rich Cohen for Sports Illustrated.